For years - I have been too intimidated to take the kids swimming by myself. About the time the girls could swim decently, Will Holden was a baby and I had to contain him. 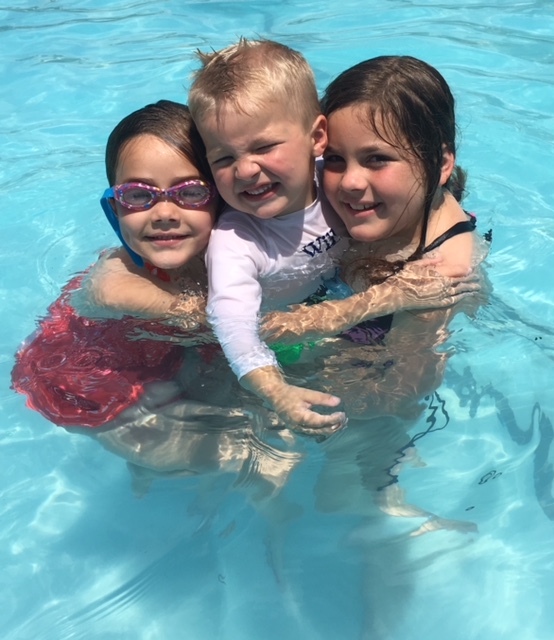 This is the first summer when I feel like I can take them all to the pool. The girls are great swimmers and I can manage Will. Only he really ONLY wants Harper to hold him in the pool. They are so sweet to play with him. I'm so thankful for what great sisters they are. I look forward to more pool days in our future! Friday night the kids wanted to have popcorn and a movie night so we did just that. Will Holden crashed in the middle but my girls are night owls. The girls and I are in a fashion show this coming Friday night. It's a big event to raise money for the NWA Women's Shelter. We are modeling clothes for Old Navy so we went and picked out our outfits on Saturday. Hollis picked this romper and I ADORE it. I love the dress Harper has on but she wanted a more casual "older" looking outfit. She picked one out and it's cute too! I took the girls on a few errands after. Hollis' face sums up how we feel about Sam's club on a Saturday morning. ha! Crazy town. Scott spent hours cleaning my car Saturday. It was so bad he had to break out the pressure washer. ha! I'm pretty sure he would like to take a pressure washer to the inside too. He doesn't understand how it gets so dirty. But he doesn't drive three kids around for hours every day. Our fireman friends had to visit a house down the street while we were playing outside. Will Holden was yelling "That's my best friends!!!" The sweet fireman stopped back by and said hi! Yesterday we had church, ate lunch, and then Harper and I went to a meeting about church camp. We go in a week and I'm so excited! Last night our youth led a worship service and then we had an ice cream social outside. It was so much fun! The kids were all playing while we talked. It was my favorite kind of night! After we got home, we decided to take a walk and pick honeysuckle. When I was little, I always wanted to pick enough honeysuckle to try to get the little drops to fill up a cup. It's like an unachievable goal. But we decided to try for it. Of course, it didn't work. But we tasted a lot off the stems and the girls loved trying! It's the simple things like swimming, ice cream socials and honeysuckle at night that make the best summer memories!